It's just a cocktail, until a bar tender, dressed in white & black with a boyish smile on his face explains each ingredient and how it contributes to the final product. How the smokiness of the spirit is balanced by the bitters and lemon juice. Why a chilled glass with ridges makes for a more exciting experience over a rocks class without etches. It's just a dining room, until you spend a few seconds concentrating on each feature. From the red booths that invite you in and ask you to stay a while. To the dimly lit light features that ask you to speak in quieter voices so that others may be intimate with their partners. Every nook & cranny of the space has been considered from the fireside lounge to wait for a table to the photos of the past that hang around the walls. A feeling of luxury and familiarity embrace each diner. It's just a waitress, until she gives you a road map to the extensive menu. Offering her advice as an expert from taste testing and hearing feedback from previous diners. She's excited when you order her recommendation and offers house-made bread to start off your night. 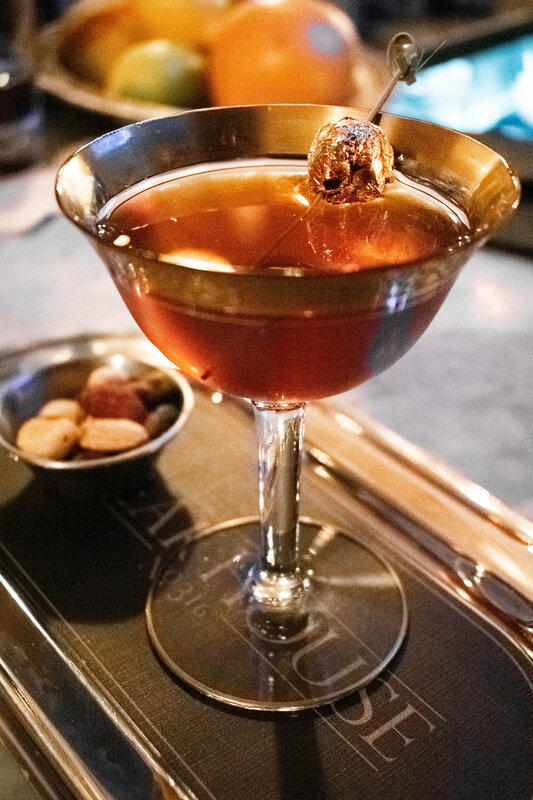 Warm, decadent, and welcoming you to your meal. It's just a steak, until you realize it's the top 2% prime in the country. That the marbling has to be just right, to offer the highest flavoring. All it needs is a sprig of rosemary but is offered with a bulb of roasted garlic to enhance the dish. Of course you'll want to try a sauce or some sides. It's all to deepen the meal, but you know it's not needed, because the steak is the main attraction. The roasted brussels sprouts are so you can say you ate your veggies while the lobster risotto is an indulgence you might keep to yourself. It's just wine, until the house sommelier listens to your favorite wines and sees what you've ordered off the menu so they may compliment your meal with a bottle. A sniff of the cork, a swirl of the glass, a sip of the juicy, tangy wine touches your lips. It's perfect. It's just romaine, until a waiter rolls a cart full of bottles and jars with an empty wooden bowl next to your table. He introduces himself and starts to reach for one. He says the name, scooping a portion into the wooden bowl, making it a little less empty. He explains that he's trained for 3 days straight in Aspen to learn the process. He continues to smile, portion, whisk, portion and whisk. Soon after, a yellowish masterpiece sits at the bottom of the wooden bowl. 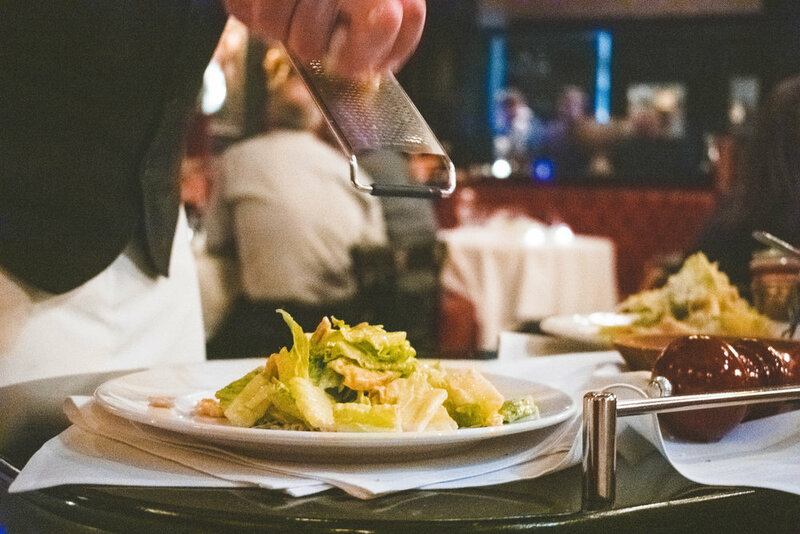 It's just romaine, until it's dressed with the labor of love this waiter created right before your eyes. It's just romaine, until fresh grated pepper dances on top of your salad, asking for a bite. It's just romaine, until you close your eyes, tasting every flavor from the cart, realizing this bite goes back decades to a man in a restaurant in Mexico during Prohibition who just wanted to feed his guests, so he pulls together what he has and creates a resemblance of what you're tasting now. It's just romaine, until you realize this entire experience has been carefully calculated and tailored to your enjoyment. Steakhouse 316 comes from Aspen, CO where they're known for their table side Caesar salad and incredible steaks. Their newest location is now in Boulder, CO inviting diners of the Denver Metro area to leave their worries at the door and take a night for themselves. Be prepared to be taken care of in the best possible way with fine-dining service meant for anyone. Not just for special occasions, bring a friend or two and sharing everything you can! Leftovers encouraged. Thank you to the Steakhouse 316 team for the incredible experience. While my meal was compensated, my views and opinions are my own.